See your work in vivid Full HD detail with a 60.47 cm (23.8) monitor that features Dell’s thinnest border for nearly seamless viewing across multiple screens. 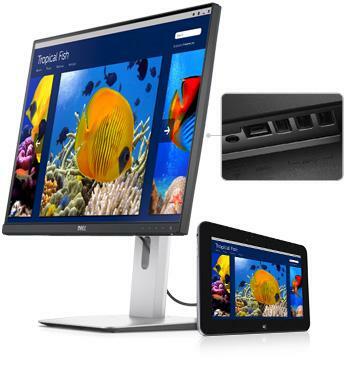 Dell's thinnest border: Create a multiple screen arrangement with near-continual imagery between multi- monitors via the Display Port 1.2 (MST) connectivity port. Convenient connectivity: Bring your compatible mobile phones and tablets to life on a large screen with 2 HDMI (MHL) ports. Connect to projectors or other compatible devices through Display Port and mini-Display Port connectivity. Fast charging: A high-current USB 3.0 supplies twice the power for charging and powering compatible USB devices. To Recieve updates and possible rewards for Dell U2414H please sign in. To Recieve updates and possible rewards for Monitor please sign in.